Husband and I went to the Ohio State Fair. 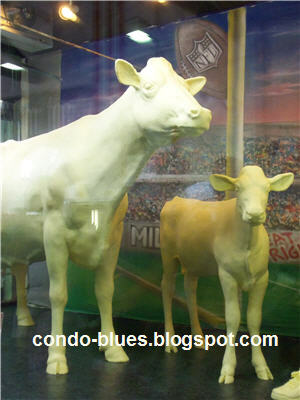 I'll post about all the funny things we saw on Condo Blues tomorrow. I saved the best for you here – the food. Husband and I ate ourselves around the fair. It was crazy easy to eat local and it’s the Ohio State Fair’s best kept secret. 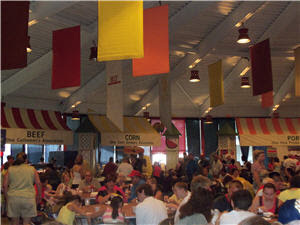 Oh sure there were the regular funnel cake, burgers, and put anything on a stick and call it fair food stands. 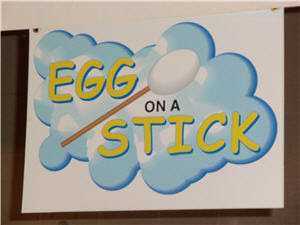 They even had Egg on a Stick! Why? I have no idea. At least they are Ohio Eggs. The best-kept food secret of the Ohio State Fair is The Taste of Ohio Café. The best tasting bang for your buck! Their food is top notch and so much better than the sorry soggy sandwiches on the midway. That’s where Egg on a Stick lives in case you are curious. Not only is it the best tasting food served at the fair it is the best value for your money. The Ohio Corn, Chicken, Dairy, Lamb, Pork, Egg, Beef, and Corn Councils serve up the best of their respective food in huge portions. 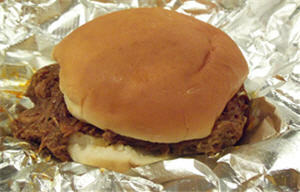 Check out the amount of meat on the BBQ Lamb sandwich I had for lunch. There was so much meat it fell off the sides the bun! I think they should change the name from BBQ Lamb to Lamby-Q. The BBQ Lamb dinner included two generous sides and huge chocolate chip cookie and cost $8.50 each. It was enough food to keep us full all day and then some. In fact, Husband and I were not very hungry when dinnertime rolled around so we just had a few light bites AKA milkshakes. Husband and I checked out the food competitions for children and adults. They had the traditional vegetable, fruit, and nut competitions and bake offs for children and adults. 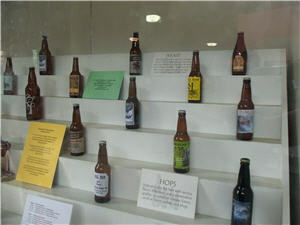 We were surprised to see that they just judged the homebrew craft beer competition! My apologies for the glare coming from the glass case in the photo. Craft beer is one of our hobbies. I didn't expect to see it at the state fair. If they need judges next year, I volunteer! The Ohio honey booth sucked us in. A half gallon of Ohio honey tempted me but the price made me pause. 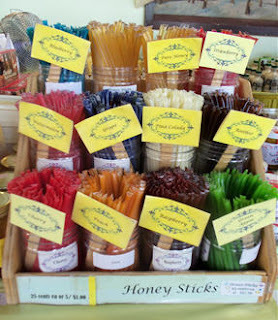 We opted for flavored honey sticks instead. The honey sticks were a much better souvenir than those silly inflatable baseball bats. They taste better too. They even had a small farm market at Fair. I tasted a homemade coffee jam that was to die for! It tasted just like a good cup of coffee with sugar in it. I bet if I spread it on my toast for breakfast, I could skip my morning cup of Joe. We didn't buy any because I have some wild blackberries in the refrigerator waiting to turned into freezer jam. We ended our day with a visit to the Dairy Products Building to see the famous Butter Cow! We likes our butter in Ohio. It is an art medium AND it tastes good on toast. By then we had room for the Ohio based Velvet Ice Cream milkshakes that they sell in the Dairy Products Building. We had to try them after our neighbor went on for 15 minutes on how good the milkshakes are when we chatted with her the night before we went to the fair. Do you have a local festival with any surprising food secrets?